I had a fabulous meal at ink last night, Top Chef winner Michael Voltaggio's new eatery. It was certainly the most hotly anticipated new restaurant of the year, and it delivers and then some. I loved every dish that I tasted (it's a small plates menu, and we ordered at least three quarters of it). They were all interesting and well-balanced and unique. The cocktails were excellent, too. If you're looking for a great review and pictures, hop over to Kevin Eats (I love his blog!). I'm happy to report that we survived a joint Thanksgiving with both sets of parents in Des Moines, Iowa. It was my parents' first trip to the Midwest, and I think they were pleasantly surprised. The cooking went off without a hitch—everybody pitched in. My father even tied on an apron and prepped brussels sprouts for roasting, something I don't think I've ever seen in my entire life! It was a loud, boisterous household, just how you want to spend the T-Day holiday. In the post-Thanksgiving, winter months I always begin to crave comfort food. Orzo, in any form, certainly fits the bill. It's a rice-shaped pasta that can be prepared much like risotto. I buy a whole wheat version, which is a great, healthier alternative to white pasta. For this hearty, winter dish, I cook the orzo like a risotto in chicken broth. Meanwhile, I saute chicken sausage (I prefer a spicy variety), kale (great in the winter months), and cherry tomatoes. To finish the dish, I stir it all together and add a healthy infusion of Parmigiano-Reggiano cheese. The resulting dish is hearty and creamy, the perfect antidote to the cold winter months. Bring a pot of water to a boil. Quickly parboil the orzo for about 4-5 minutes, until it has softened, but is still hard in the middle. Drain and rinse with cool water. Add the stock to a pan and bring to a simmer. Add the orzo and simmer in the stock, stirring regularly, until all the liquid has been absorbed and the orzo is al dente. More stock may be used if needed. Meanwhile, heat the olive oil in a saute pan over medium heat. Add the garlic and the chili flakes and saute for one minute. Add the chicken sausage and cook for another minutes. Then, add the kale and the tomatoes. Continue cooking the mixture, stirring occasionally, until the kale is tender and the tomatoes have broken down (about 5-7 minutes). Remove from heat and set aside. Add the sausage-kale mixture and the parmigiano-reggiano to the orzo, stirring to combine. Season to taste with salt and freshly ground pepper. To serve, either plate the orzo or serve family style. Enjoy! Happy Thanksgiving From Des Moines! 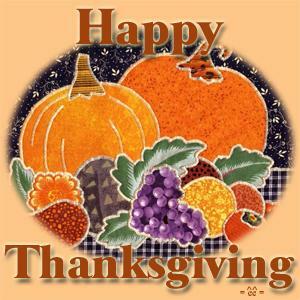 I just want to wish you a Happy Thanksgiving! Not only do I love this holiday for the smorgasbord of food, but also for allowing us to give thanks for all of the wonderful things in our lives. I'm thrilled to be able to share this holiday with both of my families this year—my parents and my husband's family—all under one roof in one town. It's sure to be crazy and wonderful and everything in between! The only thing missing is the The Adorable Monster, but I'm sure he's having a blast at Mutt Maniacs (he certainly qualifies as a mutt maniac, that's for sure). So I hope that you have a great holiday, filled with friends, family, and most importantly, food! Thanksgiving just isn't complete without dessert. Go ahead, disagree with me. I dare you. Over the weekend, a few of my close friends hosted a mock T-Day dinner. It was like a dress rehearsal for the big day (that I can't believe is right around the corner!). Turkey was baked. Mashed potatoes were... well, mashed (and made with Tofu Sour Cream, accidentally purchased by one of the guys on a frenzied last minute Whole Foods run—and it tasted great). Stuffing, gravy, green bean casserole, and sweet potatoes found their way onto the table, and from there, onto our T-Day themed plates. It was a literal smorgasbord. It was quite the feast, held before we all abscond for various hometowns across the country. I'm off to Des Moines on Sunday. My hubby has been in NYC, and will meet me there, as will my parents. Meanwhile, the Adorable Monster is off to Mutt Maniacs, from where he will emerge a week later, happy, smelly, and gloriously tired. Finally, as the meal ended, dessert was placed on the table. It had been my responsibility, and I'd decided against making pie (I'll save that stressful experience for next week, when my mother will be at my side). Instead, I decided to concoct a seasonal Cranberry Apple Crisp. I settled on it for three reasons. 1) Everybody loves a great fruit crisp, 2) I didn't have to make pie crust, and 3) there was a great Barefoot Contessa recipe that I could adapt (and had been wanting to try out). Instead of her use of peaches and raspberries (which would taste great, no doubt), I chose to use cranberries and apples, both very much in season and populating the shelves at all the grocery stores across the country. Granny Smith apples are my go to for pie—their texture and tartness hold up great. The resulting crisp was delicious—tart, sweet, rich and buttery, and yes, crispy. This is the perfect holiday dessert. It's stress-free and fool-proof, too. I promise. I should also mention here that the original The Barefoot Contessa Cookbook is one of my favorite in the whole wide world, and one of the only ones I still consult on a regular basis with the advent of the iPad and the internet. Alright, there's my shameless plug! Butter the inside of a 10 x 15 x 2 1/2 inch baking dish. In a large bowl, combine the sliced apples, the cranberries, the lemon zest, the lemon juice, 1/4 cup granulated sugar, 1/2 cup brown sugar, and about 2 tablespoons flour. Toss well. Allow the mixture to sit for 5 minutes. If there is a lot of liquid, add 1 more tablespoon of flour. Pour the apple cranberry mixture into the baking dish and gently smooth the top. Combine 1 1/2 cups flour, 1 cup granulated sugar, 1/2 cup brown sugar, salt, oatmeal, and the cold, diced butter in the bowl of an electric mixer fitted with a paddle attachment. Mix on low speed until the butter is pea sized and the mixture is crumbly. Sprinkle evenly on top of the apples and cranberries. Bake for 1 hour, until the top is browned and crisp and the juices are bubbly. Serve immediately, or store in the refrigerator and reheat in a 350 degree oven for 20 to 30 minutes, until warm. 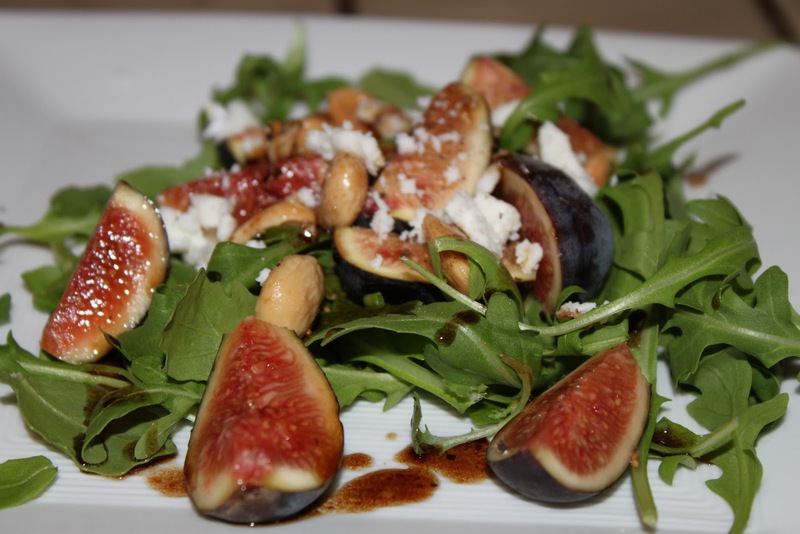 Sweet figs, tangy feta and spicy arugula don’t need much help to shine in this salad celebrating fall’s bounty. A simple balsamic vinaigrette seasons the greens, while almonds add an earthy crunch. While you're over there, check out their great articles like how to Savor a Seasonal Meatless Monday. And as always, one day a week, cut out meat. A slow start to my day due to hosting my book club last night. I made Braised White Bean Cassoulet with chicken sausage, one of my favorite comfort food recipes. Much vino was drunk and gossip was exchanged. The night crept later than anticipated, but time with girlfriends is priceless. Meanwhile, my husband is off in NYC on business. So the Adorable Monster and I have the house to ourselves. We're taking it easy on this cloudy day. Well, he always takes it easy, but I'm joining him this time. With only two weeks to go until Thanksgiving, here's another one of my favorite holiday recipes. This one combines delicata squash, which is braised in the oven, with pepitos, basil, and goat cheese. The special touch is that I brûlée the squash with brown sugar under the broiler to finish it off. The resulting dish is sweet and creamy and everything in between, making it perfect for your Thanksgiving feast. To make the squash, cut the halves into slices (they'll be semi-circles) and place in a single layer on a oven proof dish. Brush the squash with olive oil and season with salt and pepper. Fill the dishes with about 1/4 inch of water (shouldn't cover the squash). Place in the oven and roast for about 30-40 minutes, or until the squash are tender. To brûlée them, remove the squash from the oven and set the oven to broil. Sprinkle the tops of the squash slices with the brown sugar. Place the squash under the broiler until the sugar melts and caramelizes. To plate, layer the squash in a serving dish and top with the pepitos. Then, crumble the goat cheese on top (hint: place in the freezer for a few minutes first for easy crumbling). Finish the dish with the basil and some freshly ground pepper. Enjoy! Thanksgiving doesn't feel right unless there's pumpkin pie. At least, that's how I feel, and I know that I'm not alone. 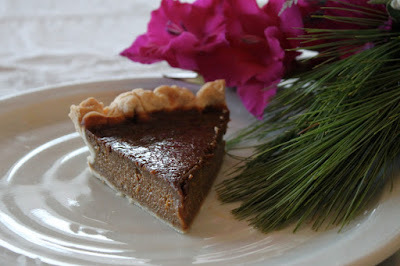 I stumbled upon this recipe for Vegan Pumpkin Pie last year, while staying with my parents in Virginia. I had limited ingredients to work with (no eggs) and a craving for pumpkin pie. Scarcity is often the mother of invention. 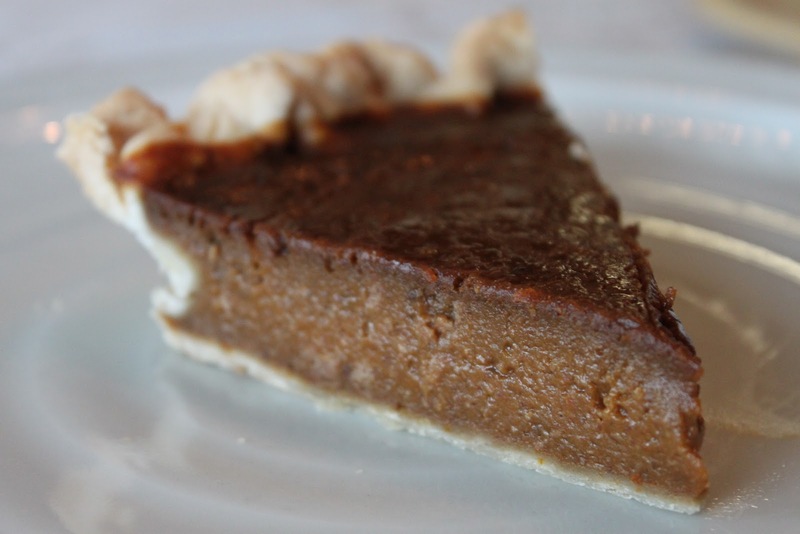 I actually like this vegan pie better than regular pumpkin pie. There's something about the almond butter and the molasses and other great ingredients that gives it an amazing richness you wouldn't expect from something without eggs and butter. This year, we're all headed to Des Moines to celebrate T-Day with my husband's family. And I'm happy to report that for the first time ever, both the Original Diva (my mother) and the Wine Lover (my father) will be trekking to the midwest to partake in the festivities. It shall be memorable, to say the least. And I'm already menu planning with both mothers, and this pie will be on the table. So without further ado, here's the recipe. Adapted from "Vegan World Fusion Cuisine"
Prepare crust and press into the bottom and sides of a 9 inch pie pan. Bake for 10 minutes. Remove from oven and set aside. Meanwhile, place the pumpkin in food processor or blender with remaining ingredients and process or blend until smooth. Pour mixture into pie crust and bake until top is firm to touch, approximately one hour. Filling may puff up and rise above crust line as it bakes. It will fall back down as it cools. I'm holed up, hard at work on my new novel. And my husband is off to NYC for work, so I'll have no excuses not to get a serious amount of work done. It's also NaNoWriMo this month (National Novel Writing Month), and many people will be trying to crank out first drafts (50,000 words) in four short weeks. Now, I'm not one of those crazies, but I do feel some solidarity in that I am hard at work on my first draft (and already have about 25,000 words and a very solid outline/sense of where this bad boy is going). I'm also launching a new writing-focused website soon, where I'll be blogging about my writing (and more personal stuff). There will also be information my novel, which is currently 'on submission' to publishers, and other fun things (for a sneak peak go to www.jenniferdawnbrody.com). And with November comes that great American feast we call Thanksgiving. This month, I'll be digging into my vaults to bring you my favorite T-Day recipes. 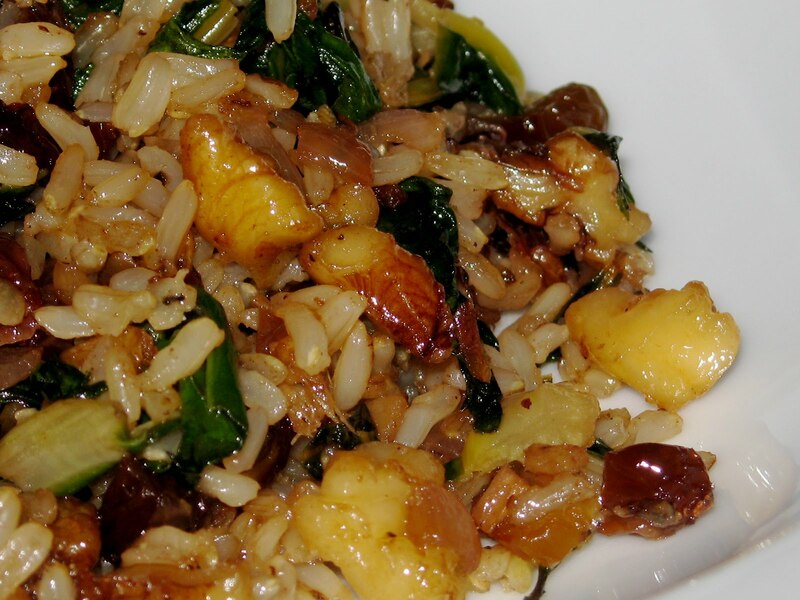 To start us off, I'm posting my recipe for Raisin Walnut Spiced Rice. This is sort of like a fried rice, but with different flavor profiles. I love making it in place of a traditional bread stuffing. It's far healthier, using whole grains and incorporating greens, and more flavorful, too. Fresh ginger, shallots, and raisins add nice sweet and spicy flavor. This recipe has also been featured my Meatless Monday. And stay tuned all month long—lots of great T-Day recipes are coming your way! Add the shallots and saute for a few minutes, until beginning to soften. Add the ginger and cook for another minute until fragrant. Next add the raisins and walnuts and cook for a few minutes. Add the Swiss chard and stir into the mixture. Continue cooking the chard until it's tender. Finally, add the rice to the mixture and stir to combine. Reduce the heat to medium and cook for another ten minutes, stirring occasionally. The rice should take on a nice, nutty flavor. Stir in the chopped parsley and season to taste with salt and pepper. Enjoy!